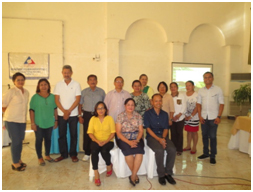 Consistent with the government's thrust to empower Micro, Small and Medium Enterprises MSMEs, the local government of Dapitan City through the City Tourism Office and Tourism Industry Tripartite Council in collaboration with the Department of Labor and Employment, successfully conducted an orientation seminar on Labor Laws Compliance System and other relevant DOLE programs and projects on February 24, 2016 at Dapitan City Resort Hotel. The welcome message of City Councilor Alexander Estacio jumpstarted the seminar who empathically declared that the local government of Dapitan City is very supportive to the business community as it is driving force our local economy. The event was participated in by a total of thirty nine (39) partner-stakeholders mainly comprising of entrepreneurs on tourism-related businesses in Dapitan City. It can be recalled that Tourism Industry Tripartite Council and Hotel, Restaurants and Pension Houses Owners Association recently conducted their induction ceremony for their newly-elected set of officers. It was during the said event that a consensus was reached that the councils will organized a learning session on DOLE Programs especially including the general labor standards. Labor Laws Compliance Officer, Cyrus P. Tingcang led the discussion on various topics which substantially included the minimum wage law and its remedies on how to enjoy exemption from the law's coverage. This is in line with the department's track of harmonizing and balancing the right of labor to its just share in the fruits of production and the right of enterprises to reasonable returns on investments, and to expansion and growth. Significantly, the participants expressed their enthusiasm and manifested their desire to cooperate and disseminate the beneficial features of the LLCS. Along this line, Regional Director Sisinio B. Cano issued a public advisory that DOLE 9 is ready to conduct advocacy forum at the community level in coordination with its partners and non-government organizations concerning DOLE Programs and Projects.